The title kind of sums it up, but Mags worked very diligently to help Boppa with a project recently and earned some cash. Little Miss Ramsey gave some to God and some to a gift and then took what was left, along with allowance (for feeding Newman) that she’d been saving up, and went to Wal-mart on a mission. 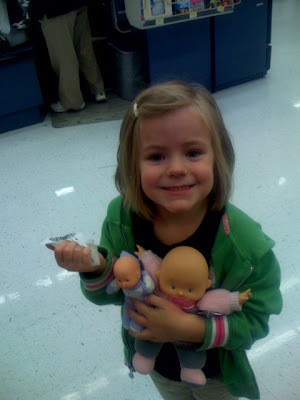 She was looking for the most dolly that $5 could buy, and here’s what she got…with 18 cents change too! Just in case you were wondering, the bigger baby is Mollie and the little baby is Mary. Somehow, despite the size difference, these babies are twins. Mo, that is so funy that they are twins! I got a good laugh out of that! I love you and miss you! Keep the pictuers coming!